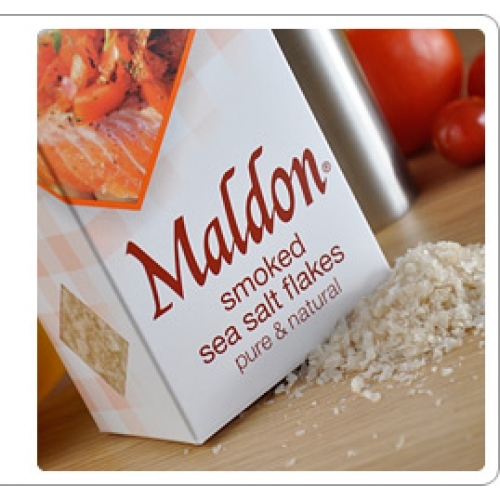 Home > Maldon Smoked Sea Salt 125g. Maldon smoked sea salt is pure and unique, made using only traditional natural methods. Add an extra dimension for seasoning meat, fish and poultry, enhancing the natural flavors. Using traditional smoking methods to gently cold smoke the salt crystals, ensures a truly exciting taste. Its pronounced and distinctive 'salty' taste combined with a deliciously subtle smoky flavor, adds sophistication to your favorite dishes. Great on shellfish and meats, use in sauces, salsas, soups and marinades.